The Esdra estate was created around a villa with a complex architecture, resulting from the influence of the Angevin, Aragonese and papal dominations that the city of Pontecorvo experienced between the 15th and 17th centuries. This enchanting place in the Liri Valley is surrounded by the Ausoni mountains within the Aurunci National Park. A dream location, which is only the starting point of a 360-degree experience that reinvents the concept of vacation: the Esdra estate is located just 30 km from Sperlonga, both a seaside destination and one of the most beautiful villages of Italy, and about one hour from Rome and Naples. Hence, your stay is not only an opportunity to explore the natural wonders of the Liri Valley, but also to visit some of the most important Italian cities. Here, there are activities for all tastes: from the lovers of sports and culture to those who simply want to relax. 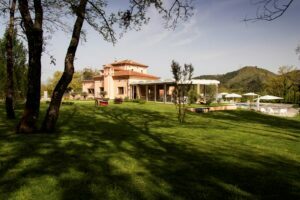 All guests of the Esdra Agriturism can benefit of all the extra services offered: a poolside cocktail, a massage, a wellness circuit, a gourmet lunch at our restaurant, a rich salad on the veranda or by the pool… At Esdra, guests can design their experience while feeling at home and savouring every season. Couples can enjoy unique relaxing moments with personalized massages, a sunset cocktail, or a romantic dinner. Kids can be kept entertained by our professional animator! Our athletic guests can train on our hiking and mountain bike paths on demand, or exercise outdoors and in the woods of the estate.